You have a couple of options for getting tickets to watch Real Madrid play. One of the best ways is to call the Real Madrid ticket hotline on (0034) 902 234 234. They have English speakers manning the hotline so if your Spanish is not up to much, then ask for an English speaker. They will be able to tell you what matches have tickets available and when those matches are occurring. They should also be able to hold tickets for you to be picked up at the ticket office (tarquilla). This is situated between gates 1 and 6. You can pay for and pick up your tickets 1-5 days before the match. Alternatively you can buy tickets from an online ticket agency. The upside is that they often have a better selection of seats than the Real Madrid ticket office. The downside is that those tickets will cost you roughly a third more. The cost of a ticket to see a Real Madrid game depends upon who Real is playing, but here are some rough prices that you can use as a guide detailing what you will pay. The main road that runs right past the Bernabéu stadium is known as Paseo de la Castellano and here you will find a myriad of bars, restaurants and hotels near the stadium. Here is a selection of our favorite hotels in and around the Santiago Bernabéu stadium. Less than 0.3 kms away from the Bernabéu this hotel offers stylish accommodation that is right in the heart of the business district. Prices start from €66 per night. The Holiday Inn offers a comfortable and clean setting and is surrounded by famous shops and quality restaurants. It is less than 0.4 kms from the stadium and prices start from €82 per room. 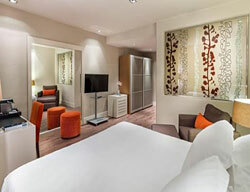 This 4 star hotel offers a good standard of accommodation at a reasonable price. Rooms start at around €51 per night and it is only 0.7kms from the stadium itself. If you like your accommodation to be cheap and cheerful then you should consider Infanta Mercedes. Small and charming, and at around €45 per room per night, this hotel is only 0.8kms from the ground. The main airport that serves Madrid is Madrid Barajas International. It is situated around 12kms from the city centre. It is one of the busiest airports in Spain and transport links are very good from here. Costs into the city from the airport are around €2 for the metro, €2 for a bus and around €20-25 for a taxi. From the city centre, hop on the dark blue line 10 heading towards Fuencarral and the Plaza Castilla. There is a stop right outside the stadium called Santiago Bernabéu. The metro runs until 1am and the cost for a single ticket is around €1. Buses run back and forth along the Playa de la Castellana all day and night. So there is no shortage of buses. This is a main road that runs alongside the stadium itself. Numbers 14. 27, 40, 43, 120, 147 and 150 all stop right outside the stadium. The main bus company is known as EMT (Empressa Municipal de Transporte). Ticket costs are around 1 Euro for a single journey. The night buses are known as ‘Buhos’ which means owls. You may have to wait up to 30 minutes for a night bus, but it is the same price as during the day. The cost of a taxi to the ground should be around €10-12 and there are always plenty of them about. However when coming out of the stadium, you might have to wait for a while. Note: Take heed that some unscrupulous taxi drivers will charge more than 3 times this price and will take advantage of tourists, looking to enjoy a match. So always make sure that the meter is switched on and ask the price before you get in. The Santiago Bernabéu stadium has to be one of the most iconic football grounds in the world. It is steeped in history and has been the home of this great footballing club since 1947. It is officially Europe’s third largest stadium after Barcelona‘s Nou Camp and Borussia Dortmund’s Signal Idina Park and has a capacity of 80,354 seats. It is located in the northern half of the city adjacent to the north-south Paseo de la Castellana and is extremely well connected by the city’s bus and metro services. In 2005 the latest addition to the stadium was added when the east side gained an extra tier and 5,000 extra seats.. The Bernabéu is very ‘TARDIS’ like in a way that from the outside, the stadium doesn’t appear all that large. However once you enter the stadium, it soon becomes apparent as to the size of the place. Add to the mix 80,000 passionate fans, and that is some spectacle. What can I see on the tour? Once inside you get a panoramic view of the stadium, you can step onto the pitch itself, take a visit into the players changing rooms and the tunnel, also take a look into the club’s rich history with a tour of the trophy room, as well as a visit to the presidential box and the club shop. How do I get a stadium tour ticket? You don’t have to pre book a ticket you can simply turn up at the ticket office at the stadium which is located near to Paseo de la Castellana. Stadium tour prices are €15 for adults and €10 for children. Real Madrid also organise special rates for groups and schools. When Real play at home, the tours are closed 6 hours before match days and access is sometimes limited. If you are unsure whether Real are playing at home, then it is advisable to check out their official website at www.realmadrid.com. If you are going to go on the stadium tour, then it makes sense to add a Museum Tour as Real Madrid has an incredible past and is a club that is steeped in history. Plus when will you ever get the chance to see European Cup trophies in one place again? The Real Madrid museum serves as a testimony to the clubs’ achievements over the years. There is lots of history written about the club which you can read as you are wandering through the museum. It is written in both Spanish and English, so there is no problem translating it. There is also a large wall crammed with photographs of every single player who has ever played for this great club. Why not try to pick out your favourite players, Di Stefano, Puskas, Cruyff, Zidane, Beckham or Christiano Ronaldo, they’re all here. Elsewhere in the museum you will see football shirts and boots all worn by players past and present, so you can really get a feel for what it’s like. Also there are a collection of match balls from the early years, right through to the modern era and you’ll be amazed at what people used to wear and the equipment they used. Finally move through and you will see on display all the trophies that the club has won down the years, plus photos of the team’s most memorable moments. It makes for an amazing amount of silverware. At the time of writing the museum tour will cost €17 for adults and €12 for children under 14. You will need to allow around 30-45 minutes to complete the tour itself. You don’t have to pre-book and can purchase your tickets at the entrance. Note: When visiting the museum, you will be asked to have your photo taken with a cardboard cut-out of some of your favourite Real Madrid players. This is quickly packaged in a frame and resold to you in the club shop. Please be aware that if you buy this, it will set you back €17 for the larger picture, which is as much as the entrance fee to the museum. The museum is open from 10am -6.30pm every day of the year except for December 25th, January 1st and January 6th. The main road that runs right past the Bernabéu stadium is known as Paseo de la Castellano and here you will find a myriad of bars and restaurants. Here is a selection of our favorite bars and restaurants in and around the Santiago Bernabéu stadium. A typical ‘Cervecceria’ offering a good selection of tapas and cold beer. Also on offer is a menu del dia. Prices are reasonable as a tapas and a beer will set you back around €2.50. Distance from the stadium is around 100 metres. Alfredo’s barbacoa is a Mecca for pre match eating and drinking. At Alfredo’s you will find probably the best burger in Madrid and at only €2.50, it’s a real snip. Other favourites include, sticky ribs, which fall off the bone, and sizzling steaks. Wash this down with a glass of something cold and you are set up for the match. The distance from the stadium is approximately 1.2 kms and takes around 15 minutes to walk, although the walk is probably much needed after the food.